Oh you got this far? Well here’s your reward. This entry was posted on Monday, January 26th, 2015 at 1:28 am	and tagged with definition, disscussion, explanation, god, logic, long post, math realism, moral realism, moral relativism, morality, objective morality, Philosophy, realism, reply, responce, subjective morality, teleological explanation and posted in agnosticism, Atheism, bible, christianity, gnosticism, Philosophy, Religion, Science, skepticism. You can follow any responses to this entry through the RSS 2.0 feed. « What Are We Teaching the Next Generation? Oh… one more thing: ‘If pastors and priests where to be honest about the horrors and injustices found with in their book, then I might be willing to concede this point.’ This side of the pond, I’ve found plenty of such pastors and priests – Christians who, like me, who continue to be horrified by what is said in some quarters in the name of God. I cannot speak for your side of the pond, but I don’t think it helps the discussion if you have tarred us all with the same brush before we even start. Fair enough, but typically when Christians defend their belief they rarely concede, as you have, the problems while they extol the goods. Perhaps it is different on the other side of the Atlantic, and in some ways it would have to be, but it is a very common problem that I run into from Christians of all stripes and places. So I apoligie for my generalization, I do not mean every single christian. I only mean to say it is a pervasive problem, at least in my experience. ‘…but you must justify why…’ No. I don’t have to justify anything. Why? Because I’m not asking you to subscribe to my theistic point of view. Rather, I am suggesting that the idea that slavery is wrong, which we both share, is a point of common concern that could unite us in actions that promote social justice, *despite* the fact that we hold very different world views. We don’t have to agree about the existence of God, nor even about the value of believing in God, in order to share a desire for a more just world. I am also suggesting that uniting in this way might provide more benefit to humanity than participating in the kind of arguments about morality that serve only to entrench our differences. I have seen plenty of such arguments – where neither side is really interested in other person’s point of view and the whole purpose seems to be to assert the superiority of one’s own position. Is that what you and Sirratiocination are doing? I’ll leave that for you to decide. But it was not this specific discussion that led me to say ‘how about we stop arguing among ourselves?’ Rather, it was the more general observation that an argument that focuses on difference can sometimes get in the way of our ability to work towards a common goal – in this case, the promotion of justice. And I would see that as unfortunate, bearing in mind that the whole point of a moral framework (as I understand it) is to help create a just society. There have been some interesting comments on both sides of this debate. However, I’m more interested to know where it is actually going? What is the point? Sirratiocination makes the point that subjective morality is weak because it is based on human goals and hence is subject to human caprice. With Teeth makes the point that a morality based on the Christian God, as revealed in the Bible, is weak because that God appears to be violent, capricious and condones slavery. I would answer ‘Yes’ to both because it seems to me that human caprice, wilfulness and fallibility are the major reasons why basing our morality on either system ‘doesn’t work’. You only have to look at US gun culture to see that upholding an individual’s right to protect their freedom has it’s down side. Similarly, you only have to look at the sweat shops in India and the Far East to see that slavery is still alive and well in our Western, globalised free market culture (involving both Christians and secular athiests) and that most of us turn a blind eye to it. To my fellow Christians, I would say this: Yes I do believe that God provides us with a model of objective morality. 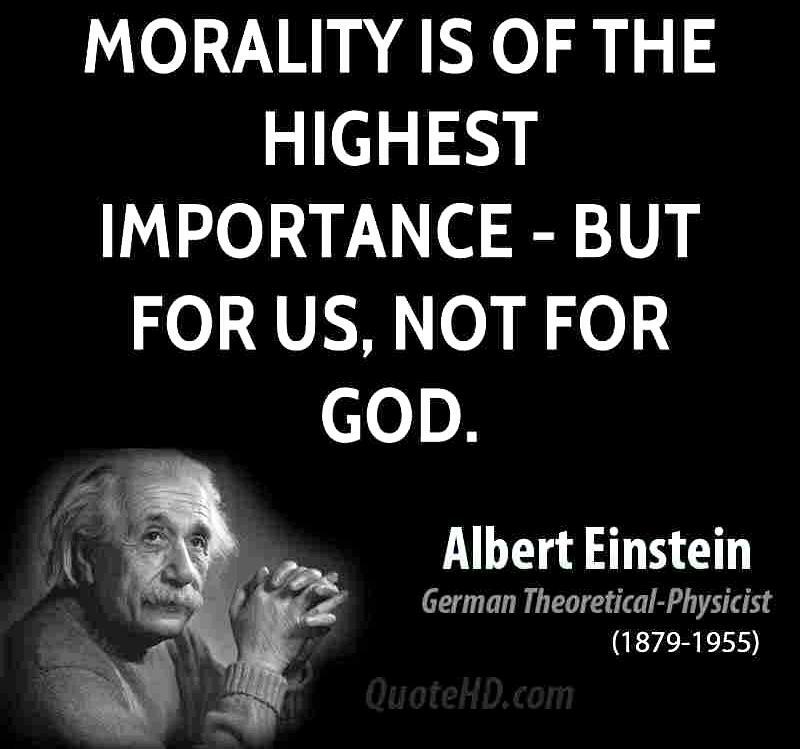 Yes I do believe that the foundation of this morality lies in God’s character. Yes I do believe that God continues to reveal that character to us and that s/he does so most profoundly in the person of Jesus. Yet, despite this, we are human and we get things wrong. In fact, right now, we are getting the whole free market economy thing wrong. In the person of Jesus, whom we supposedly believe embodies God, we see someone who upheld the full personhood of the poor and dispossessed. We see someone who wasn’t afraid to challenge corrupt systems of power. We see someone who was a living embodiment of sacrificial love and who invited his followers to be the same. Is this God? Is the person whom we profess not only to worship but to follow? Then I think we need to take a good, long hard look at our own morality before we even think of pointing the finger at any atheist (or muslim if it comes to that). Our first question should always be ‘Do *we* want to be involved in what God is doing in the world?’ And if the answer is ‘yes’, then let’s get on with it. And to atheists I would simply say this: The reason I want to try and live by Jesus’ moral code is because I believe it works. I don’t believe it to be violent or capricious. Nor do I believe it to condone slavery. However, I don’t believe it to be an easy thing and that’s why I think a lot of us fail – including me. But if, like me, you also believe slavery to be wrong and if you are prepared to bite the bullet and try and make a difference, then how about we stop arguing amongst ourselves and work together to do what we can to put an end to it? Well if you want to us the bible as a source fine, but you must justify why you use some part and why you use others as well as justify both the initial use of the bible, and the methods in which you sort through it. Christian too often which to have their cake and eat ti too, but claiming the bible is God’s word, but it is also completely up to them to pick and choose versus to fit their preferences. I sail against that becuase of how subjective it is, which you might find odd becuaseI was defending the subjective veiw of morals, but one must understand that there is a spectrum between the purely subjective and the purely objective. While I did mention this I will admit I glossed over it because this is just part of the discussion. But really my argument is that sirratiocination has offerd up a false dichontmy which one option useless and the other unattainable unless you assume the christian god. There there is a range of options that sit between objective and subjective, with thing like science and philosophy sitty far closer to the objective side then the subjective, why? Becuase thoser two feilds are buold with system to eliminate bias. They are not perfect hence why they are not fully objective, but either can they be fully subjective because there are not purely based on those biases and whim of us sentient creatures. Can we stop arguing? No. If we did we’d stop learning and trying to improve our ideas. We would allow for stagnation. What you see above is a complex and nuanced discussion between two people with different ideas. Yes we pose arguments and argue them, but that is how meaningful discussion takes place. Argument when properly done is not some yelling match, it is discussion to reconcile opposing or seemly opposing ideas and to draw useful conclusions, so that future work can be done better. I also think that if we stop holding ancient texts written by a desert dwelling, slave owning, and otherwise violent tribes/groups of people as a moral master piece. If we get people to stop holding these deeply problematic texts as capital ‘T’ Truth and as moral frame works we can aspire too. Then maybe the general population will look for more robust sources of morality. At least if pastors and priests where to be honest about the horrors and injustices found with in their book, as well as the good parts, then I might be willing to concede this point. But people think the bible is a moral book, but at best it is over all amoral, full of both bad and good with no real ability to answer pressing questions be them moral or otherwise.